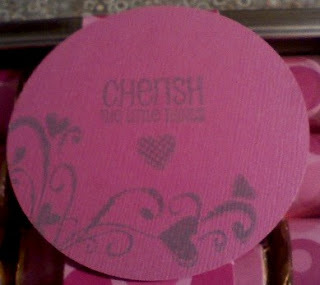 It reads "CHERISH THE LITTLE THINGS"
I never made Nugget tins before. 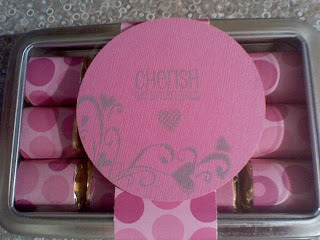 I was delighted how simple it was however, I wanted to try out come clear stamps I bought recently. I am not totally won over by the look, but hey, the candy was all the recipient was anxious about. The picture isn't really good, because you can read it better .. but I guess the light was reflecting. I am sorry. I like the nugget idea.. only next I am filling it with the snowflake/ flowers made with the punch tags as part of a Birthday/christmas gift!